This blog is the eighth in a series of posts written with staff and students at Oregon Active Schools elementary schools. Oregon Active Schools supports programs that inspire a lifelong love of physical activity and its many benefits for every child in Oregon through opportunities to be active before, during and after school. Q. What makes your school special? We can earn student of the month. We have lots of friends. Q. What is your favorite part of recess or PE? I like to do cartwheels with my friends. You can play on the playground. We get exercise, and we get to learn. You get to enjoy the sun. Q. Why are exercise and play important? You can play with your friends. Q. What makes your school and students special? Hillside Elementary School is a modern school in a beautiful mountainside setting. Something special about our school is we have electives three days a week. Students get to choose which elective they would like to participate in. Electives change every four to six weeks, allowing students exposure to multiple active activities. Some of the current elective options are nature hikes, 80s aerobics, rock climbing, obstacle course, dance party, relay races and soccer. Students look forward to their electives and value the choice. Q. How did your school use your Oregon Active Schools grant? Finding opportunities for more Hillside students and families to become active was an important goal for our school. This year, Hillside participated in the Mayor’s Cup Fun Run. We promoted the event through emails, presentations and social media. The grant allowed us to assist families who were unable to pay the entry fee. We look forward to this becoming an annual tradition. Our student leadership team served as the planning committee for our second goal: creating a walk or bike to school day. They connected with community businesses, mapped out walking routes and worked with our local police officers to create a day where students and families could walk or bike to school. They also created advertisements and fliers. The walk or bike was followed by an outdoor party with music, granola bars, bracelets and water. We believe that by providing a special day for students to walk or bike to school, we will encourage families to walk or bike more often, instead of driving. Q. What changes have you seen in your school since it became an "Active School?" Both of our events were successful and will now be part of our annual Hillside events. The student leadership team felt empowered by the opportunity to facilitate such a large event. Q. Why do you believe physical activity in schools is important? Research is clear about the correlation of physical activity with better academic results. At Hillside, we strive to include physical activity throughout the day. Often it will be a quick moving activity, such as a Go Noodle movement video or crossing the center line stretching activity. With our recess time and electives we keep our students moving. Hillside Elementary School is in Jackson County School District. This blog is the seventh in a series of posts written with staff and students at Oregon Active Schools elementary schools. Oregon Active Schools supports programs that inspire a lifelong love of physical activity and its many benefits for every child in Oregon through opportunities to be active before, during and after school. I like to play and have fun with my friends when I’m in PE and at recess. The best thing about PE is when we learned how to jump rope. I like to play tag in PE and at recess. My favorite part of recess is getting to run. My favorite part of PE is when we get to play tag games. Play is important, because it is fun! Exercise helps you grow up to be healthy and strong. Exercise helps you grow big strong muscles, and it is fun. I think exercise is important, because it makes you sweat. Our school is special because we are located in a small rural community. Our students and families know each other very well, and it is like a large family. A little more than fifty percent of our students are English Language Learners. Students come in at all different language levels, but our school is awesome about meeting the needs of each of our students. Parkdale is special because of the people who work here and the kids we serve. Having worked in multiple schools before this one, I have found that Parkdale is incredibly unique thanks to the autonomy of the teachers in regards to their belief that all students truly can learn, as well as the hard work I see teachers putting in on a daily basis in order to promote this learning. Parkdale used the Oregon Active Schools (OAS) grant in several ways. Our first priority was buying much needed basic physical education equipment in order to provide a varied and standards-based PE class to all students at Parkdale. We bought jump ropes, several types of balls/beanbags and other basic supplies. These purchases allowed us to eliminate wait time for our students in PE by putting the appropriate equipment into each student’s hands. The OAS grant also allowed us to offer “non-traditional” opportunities for our students in their PE class. With new equipment, we were able to teach a wide variety of activities students had not previously been exposed to, such as team building skills and racket sports. This gives our program the opportunity to engage all students and to give them the confidence to participate in a variety of physical activities as they continue to grow. We also used the OAS grant to purchase some new technology for our students to use in PE. We bought a tripod to hold an iPod so that students can begin to self assess their own skills through recording and observation. We are also getting ready to roll out pedometers that can be uploaded with individual student data at the end of each class. This will allow students to track their steps taken and activity time while in class. The data will be used to help assess the effectiveness of lessons and to encourage students to be fully engaged in class. Finally, the OAS grant was used to help overhaul the whiteboard in the gym. Students are now using the area to self assess their performance in class. This area is helping the students become more aware of themselves and take control of their own learning. The biggest change I have seen is at recess. Students are now participating in activities at recess that they learned in PE. I like to think that good PE is contagious and not limited to the four walls of the gym. When students are able to take something they learned in class, make it their own and use it outside the classroom, that shows that it is important to them. I also have parents telling me that their students are introducing activities that we are doing in class at home. It makes me smile when a parent tells me, “I played Man in the Mirror with my daughter last night before we went to bed." As the physical education program continues to grow at Parkdale, I will continue to look for ways to make natural changes. For example, some of the staff that supervise recess have been approaching me about the recess equipment. We are already brainstorming about how we can use some of our OAS grant funds from next year to improve our recess program. The OAS grant was the catalyst we needed to start this positive shift in our students. Coach Hassell continues to come up with new ideas to teach the kids and new tools to use during PE time. The kids love the fast pace and the new, fun activities they are presented with. He also provides teachers with games and activities we can incorporate in the classroom. This saves us enormous amounts of time, because we don't have to teach the students the activities, and we can get them moving in our own classrooms. My kindergarten students look forward to seeing Coach Hassell and going to PE every school day (even when PE is not scheduled). Coach's straight-talking, developmentally appropriate teaching captivates my students. They happily go to PE and return to me as sweaty, red-faced, physically-spent and euphoric kinders! After PE, we have 35 more minutes of school. Some days this is a difficult time because my students are tired and looking forward to going home. On PE days, the last part of the day provides a time for focused learning for most of my students. I think this focus comes from the physical activity they just experienced in PE. While I give my students brain and movement breaks throughout my instruction, there is nothing like 40 minutes of physical activity to fire up the brain synapses. PE is hands down the majority of my students' favorite part of the day. It is a place where they are so engaged mentally and physically. At the end of the day students write memories from their day on slips of paper that go into our memory jar. Every PE day they are excited to write down and remember the game they played, the skills they learned and their successes. We have PE early in the day, and on those days students come back ready to focus and engage in academic content. Parkdale Elementary School is one of Hood River County School District's eight schools. This blog is the sixth in a series of posts written with staff and students at Oregon Active Schools elementary schools. Oregon Active Schools supports programs that inspire a lifelong love of physical activity and its many benefits for every child in Oregon through opportunities to be active before, during and after school. Kindergartener: That our school keeps us safe, and we are respectful and responsible. 1st Grader: Other kids and myself helping each other. We help clean up our classroom and our school. 2nd Grader: My friends and teachers make this school special. 3rd Grader: Our school is special because everybody is friendly. The students in my class and my teacher is very nice. They always share. 4th Grader: Our school is special, because we don't have that many kids so it's easier to work. Our class is small, and so that gives me more time to be with the teacher to understand things. My teacher gives me options of where to sit to learn better. Kindergartener: My favorite part is doing superhero moves in PE. We lift our legs and stretch our arms. I loved Temple of Doom. You get to play a lot and it's kind of exercising. 1st Grader: My favorite part of PE is when we exercise. I like stretching. 2nd Grader: My favorite part of recess is tetherball, because I like hitting the ball and winning. 3rd Grader: My favorite part of PE is getting to do the stretches. This unit in PE you listen to music and do hula-hoops, step aerobics and stretches like exercising. I like this unit more than Temple of Doom, because you get to listen to music. At recess I like hanging out with my friends. 4th Grader: My favorite part of recess is practicing volleyball, because I am getting better at it. I really like the assemblies and a lot of things in PE. I especially like Temple of Doom and the Pirates of the Caribbean. I like getting my energy up, and the obstacles are fun to do. Kindergartenr: It will make our body healthier and make you skinnier. 1st Grader: Exercise is important, because it helps your heart go and it gives you energy. 2nd Grader: Exercising is important, because you need oxygen for your body. Exercising keeps you healthy, helps you do more stuff, and you can go places. 3rd Grader: Exercise is important, because you can get fit and be healthy. 4th Grader: Exercise and play are important, because they help you not get overweight and it helps you stay healthy. Sarika Mosley, Principal: Our school is incredibly special, because we have parents, students and teachers who care about every part of our students’ day. We strive hard to provide the necessary academics and differentiate our lesson so that every child’s ability is met. We have a wonderful group of teachers that know our students and parents well, that want to make a difference in their lives. We have one of the best playgrounds I have seen, with detailed blacktop games that Mrs. Herauf spray paints every summer. She teaches our students in the Fall how to play at each blacktop activity. We provide our students Music and PE every other day, and we also have a computer lab and a librarian that provide additional access to our students. Alice Herauf, PE Teacher: Our school is special because we offer so many neat things for our students. We have specialists for music, PE, and after-school programs such as volleyball and kinder basketball. Andie Nichols, Kindergarten Teacher: Being a small community we have a unique and mixed population within our schools. One common thread is our love for our community, especially the youth. We have a long tradition of excellence and quality in our extracurricular activities. To achieve this a love and foundation has been laid beginning in the elementary school. We teach these kids knowing that many will go all through school in this district and eventually return to the community. Tori Fenton, 3rd Grade Teacher: Our staff and students show respect to each other, try hard, are eager in their learning and always give 100%. Alice Herauf, PE Teacher: We incorporated Brain Games. Before a test, when they [the kids] get antsy, or days when they don’t have PE, we have these active activities for students. We have three types of Brain Games for students: cooperation, cardiovascular and spatial awareness. We differentiate for indoor and outdoor. They enhance PE and classroom activities. Andie Nichols, Kindergarten Teacher: We have put up activities around the school that we call "Brain Games." These activities can be used for additional exercise, a brain break, ease transitions, inside recess, or other academic activities that need a large motor activity to accompany them. For example, in kindergarten we use the scarves, rings of fire, tops and other games to build excitement with math and counting. The students are also getting physical activity and working on motor skills as they are practicing their math. Q. What changes have you seen in your school since your school became an "Active School?" Sarika Mosley, Principal: I see students engaged in indoor activities with their teachers during hallways transitions and bathroom breaks. I see students working together in pairs and individually trying to do their best with balancing, coordination and activating different parts of their brains. This is especially helpful during our months of snow fall when our outdoor equipment is inaccessible. Alice Herauf, PE Teacher: Our students are becoming more fit with 5-1-1-0. They are more engaged in games instead of getting into behavior issues. Andie Nichols, Kindergarten Teacher: The most obvious change is the access to equipment and physical activities that before were only accessible to the PE teacher. With 30 stations available at any time to any class the option for giving kids a mental break and quick exercise/energy boost throughout the day is a major change. Instead of a recess, kids can be involved in an active game or challenge. Another positive change is where the games are strategically placed. The placement allows teachers to use the games in times of transition to eliminate standing around and waiting. Instead they can be involved in a Brain Game. Tori Fenton, 3rd Grade Teacher: Our students are more aware of how they can use their brains and bodies in connection. They are focused on creating a learning atmosphere that helps make connections in their brains and grow them as students. Sarika Mosley, Principal: When you live in a community impacted by many hardships, such as poverty, mental health, obesity, diabetes and trauma, you must do your best to help your students moderate their emotions. These are tied directly to the physical benefits of actively engaging our students. When we tie activities to their day daily, students learn to have healthy habits that can help fight against the hardships they come with. Overall, no matter what our students walk of life, physical activity gets our students to smile, helps them maintain healthy bones and muscles, and helps them fight against any depression and anxiety that they may come across in their lifetime. Andie Nichols, Kindergarten Teacher: Our students love PE, so to me a win-win combination is to get the kids up and moving and learning something at the same time. Physical activity can increase engagement and make learning more enjoyable. From my experience, kids perform better and are ready to learn even after a quick movement activity. It gives them something to look forward to and promotes an active lifestyle that will hopefully carry over into the future. Tori Fenton, 3rd Grade Teacher: Our brain and bodies are connected and work together. Physical activity helps the brain make long term memory connections for academic advancement. Physical activity also helps keep our hearts and bodies in shape and ready to learn. Henry L Slater Elementary School is one of Harney County School District's three schools. This blog is the fifth in a series of posts written with staff and students at Oregon Active Schools elementary schools. Oregon Active Schools supports programs that inspire a lifelong love of physical activity and its many benefits for every child in Oregon through opportunities to be active before, during and after school. Q. How did your school use its Oregon Active Schools grant? A. We used Oregon Active Schools funding for a variety of things at our school! One-third of the funds were used to purchase new equipment for before school activities in the gym. Students enter the gym before school and now have equipment that is developmentally appropriate to help them start off their day with physical activity and movement. We also used some of the funds to purchase “Brain Break” books for all of the classrooms in our school. Teachers now have a book filled with ideas for quick brain breaks in order to promote more movement throughout the school day. Q. What sort of changes have you seen in your school related to physical activity? A. Students love to move, and by providing resources to encourage this they are able to move more. For example, now teachers don’t have to worry about coming up with a quick activity on their own. They can easily grab the Brain Break book, flip to a page, perform an activity to get the class moving, and then re-engage in the learning that needs to take place within three to five minutes. Also, with more equipment readily available more students can start their day with physical activity. Rather than having to stand in a long line to wait for a jump rope or basketball, we have enough equipment for students to work in small groups. Q. How have these funds supported your students' cultural and regional identities? A. We were able to purchase equipment that isn’t necessarily “traditional” in order to expose students to new physical activities that they may enjoy. Perhaps a student doesn’t like to be physically active because they don’t like traditional team sports. With funds we were able to purchase things students had never heard of, like Chinese jump ropes, omnikin balls and Velcro catch and throw sets. A. Physical activity is vital for students. Our bodies were made to move, and when we expect students to sit in a desk all day with minimal movement they become disengaged. However, when incorporating movement into the learning process, students are able to learn while also being physically active. In addition I believe it is important to expose students to a variety of activities. If they find something they enjoy they are more likely to continue being physically active as they age, which leads to a healthy, productive life. Green Acres Elementary School is one of Lebanon Community School District's eight schools. This blog is the fourth in a series of posts written with staff and students at Oregon Active Schools elementary schools. Oregon Active Schools supports programs that inspire a lifelong love of physical activity and its many benefits for every child in Oregon through opportunities to be active before, during and after school. A. In 2014, Aiken Elementary applied for the $3,000 grant to construct a walking trail, but after calculating the cost we realized the expenses for the trail significantly outweighed the aid provided by the grant. Northwest Health Foundation allowed the school to repurpose the grant to help fund the building of a new playground. This funding allowed the Aiken PTO, Oregon Active Schools and Ontario School District to partner to add three new playground structures to the Aiken campus. The ribbon cutting event was well-attended and a healthy “create your own” snack-mix station was provided by OSU Extension staff. In 2015, Aiken Elementary applied for an additional $3,000 grant to fund a walking program at the school. Aiken partnered with OSU Extension staff Barbara Brody and Jill Hoshaw to outline a plan to increase the amount of physical activity opportunities students receive in the school day. Included in this project will be a spring kick-off assembly, jog-a-thon, walking club, and recognition of students who are making health conscious choices when it comes to exercise and nutrition. A. Through the additional funding and a partnership with OSU Extension, students are given far more opportunities to get out of their desks, learn healthy life skills, and move. The new playground equipment has been very popular with students and it is the busiest place on the playground. If you drive by Aiken Elementary on evenings or weekends you can see students and other community members enjoying use of these new installations. This year, OSU staff trained teachers at Aiken to implement the use of Balanced Energy Physical Activity Toolkits. Through the use of this resource from October to December, students have increased their physical activity by 2,298 minutes, or over 38 hours. Since obtaining grant funding, Aiken has made physical education and nutrition a focus of family and community events. A. Physical activity in schools is important because we are teaching children skills to be successful in life. Health plays a major part in overall success. We know from data gathered that students who receive adequate physical activity opportunities have better behavior and academic performance. We want to provide students with the best education possible, and providing them physical education plays a crucial role. Q. 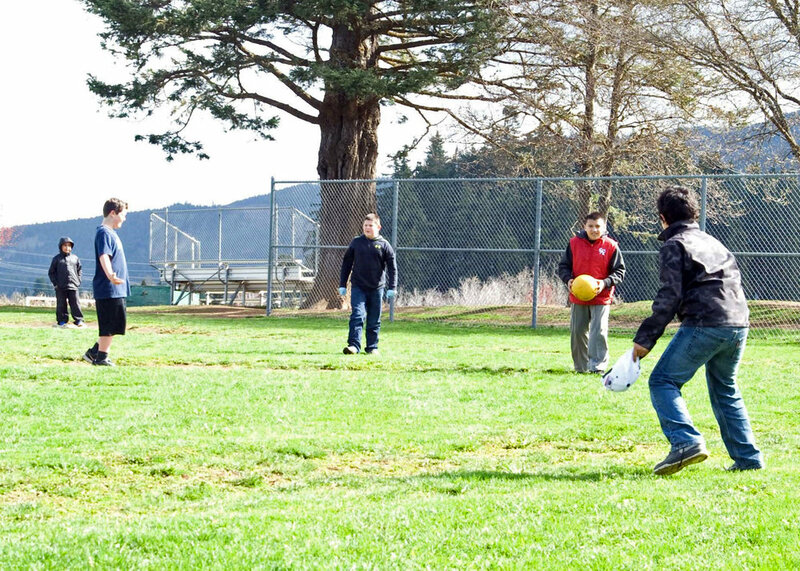 How has recess changed since Oregon Active Schools started at your school? Q. What is your favorite part about recess or PE? Q. Why do you think physicial activity in schools is important? Aiken Elementary is one of Ontario School District's five elementary schools. This blog is the third in a series of posts written with staff and students at Oregon Active Schools elementary schools. Oregon Active Schools supports programs that inspire a lifelong love of physical activity and its many benefits for every child in Oregon through opportunities to be active before, during and after school. A. At Parklane Elementary, our students LOVE to be active and play. We used the Oregon Active Schools funding to improve the quantity and quality of physically active experiences in our Physical Education classes, at recess, in our after school SUN program and during physical activity breaks. We upgraded and successfully organized our recess equipment by purchasing a playground storage bin, mobile hula hoop & jump rope rack, new soccer goals, and pinnies and cones for our Game of the Week activities. We are currently installing a new basketball backboard and hoop, as well as a volleyball court on our blacktop, which will be awesome. Maybe the most exciting addition is our new cross-country exercise Treadmarks program, which challenges our students to to run-walk-jog their way around a 1/4 path throughout our playground. Students keep track of their progress and earn rewards on their way to achieving the goal of 125 miles! A. The Oregon Active School funds have allowed Parklane to provide the students of our school with a wide variety of choices and opportunities for physical activity. In our Physical Education and physical activity-related SUN classes, our instructors are able to use some of the new equipment to enable more students to engage in vigorous physical activity for a larger percentage of the class time. At recess, students can instantly participate in our Treadmarks program for the entirety of the recess or for a lap or two before quickly moving onto another physical activity on the playground. Hula hoops and jump ropes are always in use on the playground, and our soccer and Game of the Week activities are easily organized with the addition of our new pinnies and cones, allowing for large numbers of students to join and participate with high levels of physical activity. Q. How did these funds help support your students' cultural and regional identities? A. The students at Parklane Elementary enjoy engaging in all types of play and movement experiences and these funds have allowed our diverse student body, who together speak 20 different languages, more quality opportunities to socialize and build relationships and friendships through the exciting participation in sport and physical activity. A. Schools are full of kids, and what do kids love to do........PLAY!!! It is no secret that students who regularly participate in physical activity have high levels of academic achievement, impulse control, positive behaviors and self-esteem. By providing our students at Parklane with more diverse opportunities to be physically active throughout the school day, we are providing them with safe, organized, socially engaging experiences in physical education and physical activities that can positively influence our children throughout their lifetime. Jazleen: The treadmarks help me walk more. Kavonte: A lot of people are doing treadmarks instead of four-square or basketball. Lilli: We now have more choices on the playground. Some start at treadmarks and then go to a game, or the other way around. Daniel: The treadmarks help me run faster. Darius: My favorite part about recess is playing soccer and basketball with my friends. Alex: I play with my friends at PE and have adventures. Abdiaziz: My favorite part about PE is soccer, because it is my favorite sport. Laila: Treadmarks. They help me be energized. Nevaeh: So you can be healthy. Lilli: So that you can release energy from your body. It's good for you. Holly: Because it is healthy for you. IT'S FUN! And it feels good! Parklane Elementary School is one of Centennial School District's seven elementary schools. This blog is the second in a series of posts written with staff and students at Oregon Active Schools elementary schools. Read the first post here. Oregon Active Schools supports programs that inspire a lifelong love of physical activity and its many benefits for every child in Oregon through opportunities to be active before, during and after school. Photo courtesy of Mrs. Cavaletto's We Love PE Blog. This blog is reposted from Mrs. Cavaletto's Barnes PE blog. January was a fast and furious month. We missed a day and a little due to snow and ice and then it was time to get everything ready for Marathon Kids. Now, we have over fifty 3rd-5th grade runners meeting every Tuesday and Thursday after school to run laps. Their goal is to add up all of their miles in the hope of reaching 104.8 by the end of the school year. It will be tough, but hopefully it will get done. All of that is possible because of a grant through Let's Move Active Schools, a parent who wanted to volunteer, and a few Nike employees who wanted to volunteer. Without them we never would have been able to get off the ground. I hope that I can continue the program each year. This year Marathon Kids is free for the students via a grant from Let's Move Active Schools and I hope to apply again next year. If we can get more volunteers we'll be able to support more runners. In PE we were in our Fit Lab this month where we played "activity pictionary", practiced juggling, and learned about a million dances. The forth and fifth grade students are now creating their own dance routines in the gym and will then get to play basketball. The younger students are already working on various basketball skills (dribbling, passing, and shooting). All classes have done race track fitness. This is an activity where students work on muscular endurance and balance in the center of the "track" and cardiovascular endurance around the "track". I have been very impressed with the choreography of the older students. They have done really well in the short amount of time we've had. I was out a few days being sick myself and with a sick 2 year old. I am VERY glad to be back. As the weather gets nicer I will start a recess running club. I'm just waiting for the field to be dry enough to run on. If we run the entire perimeter, it is a quarter mile. I have different prizes based on the number of miles the students complete. This will be for all students when I have time during their recess. For each mile, students receive a toe token. The five mile prize is a koosh ball, the 10 mile prize is a reaction ball, and the 15 mile prize is a giant frisbee. I'm still working on a 20 mile prize, but the final prize is a water bottle with Barnes Marathoner printed on it. These prizes are all possible from a grant via the Northwest Health Organization and Oregon Active Schools. Happy Valentine's Day to all and here's hoping for a dry field soon! Barnes Elementary is one of Beaverton School District's 33 elementary schools. This blog is the first in a series of posts written with staff and students at Oregon Active Schools elementary schools. Oregon Active Schools supports programs that inspire a lifelong love of physical activity and its many benefits for every child in Oregon through opportunities to be active before, during and after school. A. We used our Oregon Active Schools grant to start and motivate students at recess to run. We purchased charms for students to earn when they complete 20 laps. They continue to build upon this each time they complete 20 laps. Students will receive more charms, water bottles, certificates and more. The top boy and girl runners will win a new pair of shoes at the end of the year. A. More students are engaged in physical activity at recess. We no longer see kids just standing around talking. Most kids are running or walking and talking around the track. Students seem to be excited to be more active. A. Physical activity provides an outlet for students. It helps to create well-rounded kids. We improve our teaching by reaching the Whole Child. Q. How has school changed since Oregon Active Schools started at your school? A. At recess more kids run. They use to just talk. Q. What is your favorite part about recess? A. Running. You can earn charms. Q. Why do you think physical activity in schools is important? A. Physical activity can help you learn more and feel good. Hallman Elementary School is one of Salem-Keizer Public Schools' 42 elementary schools.